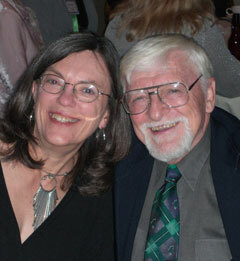 Ingrid Wendt and Ralph Salisbury, Augsburg’s ACTC Visiting Writers for 2007 will be on campus February 18-23. During the week, they will visit writing classes, meet with student writers to talk about student work and deliver a public reading from their work on Tuesday, Feb. 20 at 7:30 p.m. in Lindell Library 301. Wendt and Salisbury will also take part in the ACTC English Majors’ Conference Friday, Feb. 23 at Augsburg College. Ingrid Wendt is the author of five books of poems, two anthologies, and a teaching guide. Among her honors are the Oregon Book Award, the 2004 Editions Prize from WordTech Editions, the 2003 Yellowglen Award from Word Press, the Carolyn Kizer Award, several Pushcart nominations, and the D.H. Lawrence Award. Ralph Salisbury, Professor Emeritus of the University of Oregon, is the author of two books of short fiction and seven books of poetry. The most recent, Rainbows of Stone, was chosen by Maxine Kumin as a finalist in the Oregon Book Awards.